From March 22nd, RD4 and RD6 remote display series have been discontinued. Looking for a possible substitute, please contact our customer engineering for details. For the last time buy opportunity, the units will not have the supporting handle. REMOTE DISPLAY The RD4/RD6 are 4 or 6 digit master/slave displays providing remote readout from instruments such as programmable controllers, digital panel meters and other instruments with serial output. Two communication interfaces are supported in remote Display: RS232 and RS485 and can be programmed through front panel buttons. 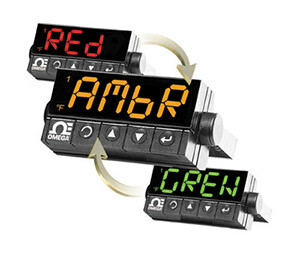 The RD4/RD6 remote display can be mounted in a 1/8 DIN panel cutout, or surface mounted with the included bale. The RD4 and RD6 features big bright 21mm (.83") and 17.3 mm (.68") 9-segment LED's that can be programmed to change color between Green, Amber and Red to indicate alarms. Serial Connections can be made to an RJ-11 jack or screw terminals.